The Mini-compendium (Bech et al. 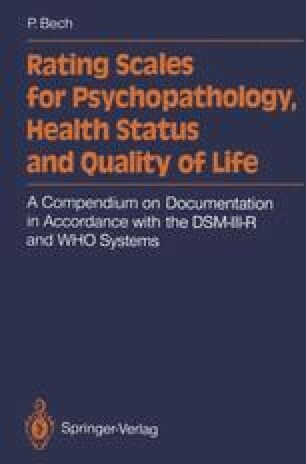 1986a) was innovative in two ways: firstly, in its attempt to guide the psychopathologist in making quantitative ratings of psychiatric syndromes such as anxiety, depression, mania and schizophrenia; and secondly in its attempt to integrate the quantitative rating scale approach with the procedural algorithms in DSM-III, because the core items of the corresponding DSM-III syndromes are rather similar to the rating scale items (content validity). These clinimetric approaches have also been adopted in this, the revised version of the compendium, which has, however, been enlarged to include all the DSM-III axes of health and disease. Furthermore, the revised DSM-III (DSM-III-R; APA 1987) categories and the draft versions of ICD-10 (WHO 1990a, b) have also been considered. The result is thus of such scope that it in fact represents a compendium or handbook rather than a mini-compendium.